The museum's location, between the many grand townhouses of Fifth Avenue and the green oasis of Central Park, allows the stairs to serve not only as an entranceway to the museum, but also as a meeting place for the people of New York. The Met steps are not only well-used by museum goers (5+ million of them per year), but also by residents and people who work nearby. People arrange themselves on the steps in all sorts of ways, lying down horizontally or sprawling vertically over many steps. The water fountains are also a big draw for all ages in summer months. The only major drawback to the area is that the closest subway stop is at Lexington Avenue and 86th Street, a good ten minute walk away. Not many people seem to be deterred by this, however. Alongside the steps are plazas with fountains, trees, and benches, where vendors sell various foodstuffs. 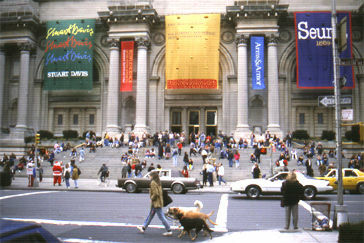 "The museum's front steps are commonly used for guitar playing, peach-eating, orange-peeling, sun-bathing, poetry-reading, cigar-smoking, book-reading, newspaper-browsing, frankfurter-eating, soda-sipping, postcard-writing, scene-sketching, picture-taking, small-talking, studying, staring, debating, deep-thinking, waiting for Godot and two of the six stages of flirting," wrote McClandish Philips in The New York Times. It may surprise many to discover that the steps were built as recently as 1975, as an addition to the Museum's 1902 Fifth Avenue facade designed by Richard Morris Hunt. The previous entrance was a narrow stairway leading to a wooden vestibule that was known as "the doghouse." In 1975, under Museum Director Thomas Hoving and with funds from Lila Acheson Wallace, the staircase and entranceway were replaced with a wider, safer entrance designed by Kevin Roche John Dinkeloo and Associates. The monumental new staircase, 13-1/2 feet high and 154 feet long, dramatically increased access to the museum from Fifth Avenue. Fountains at the sides of the steps, and a dramatic increase in trees - 76 of which were planted surrounding the fountains - were also part of this renovation. Today, the grand granite steps leading to NYC's Metropolitan Museum of Art are a destination themselves: a place to meet, eat, talk, and watch both people and Fifth Avenue traffic. 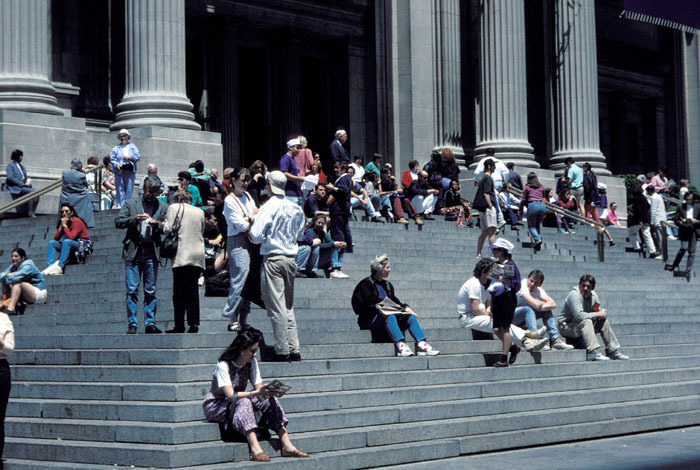 As architectural critic Paul Goldberger noted, "There are some stairs in the city - like those in front of The Metropolitan Museum of Art - that are arguably more important urban events than the buildings to which they lead."